Most of us who choose to live in the desert climes of the Southwest love the rugged look of the landscape and the subtle seasonal changes. We wouldn’t change a thing! 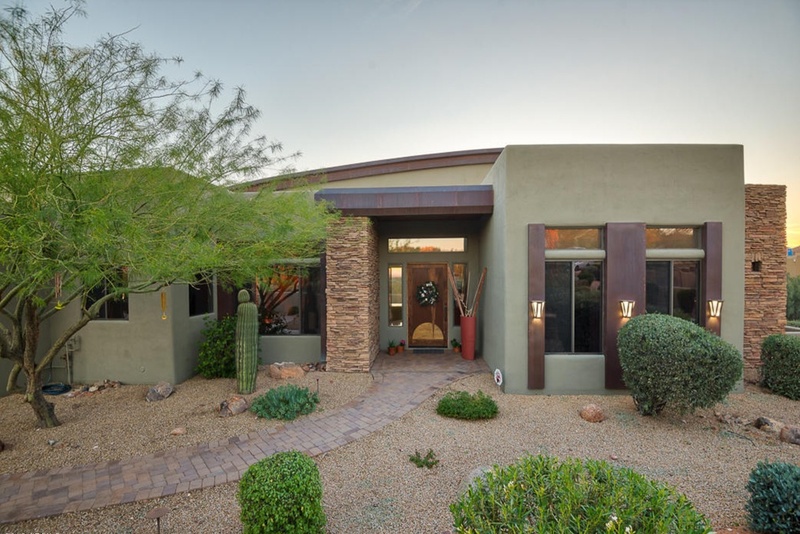 However, the somewhat monochromatic Southwestern look poses a bit of challenge when selling your home, and trying to differentiate it from all the other homes for sale. Competing for buyers means you have to think about the first impressions your home makes. Amping up the curb appeal can be simple and somewhat inexpensive, but is a critical part of the process. A power washer is your friend. A clean exterior creates the backdrop for the picture you are trying to create in buyers’ minds. So power wash the exterior of your home, the sidewalk, the driveway, the back patio, etc. Click here for tips on how to properly power wash stucco exteriors. Add a fresh coat of paint to the exterior trim around doors, windows, garage doors, etc. Painting the trim a complementary color (following HOA guidelines, if necessary). The last thing you want is for your buyers to see peeling or faded paint, and choosing color wisely will really make your home shine. Your entryway should make guests want to come in and see what’s inside. The front door is the anchor to the entryway, and should really pop. 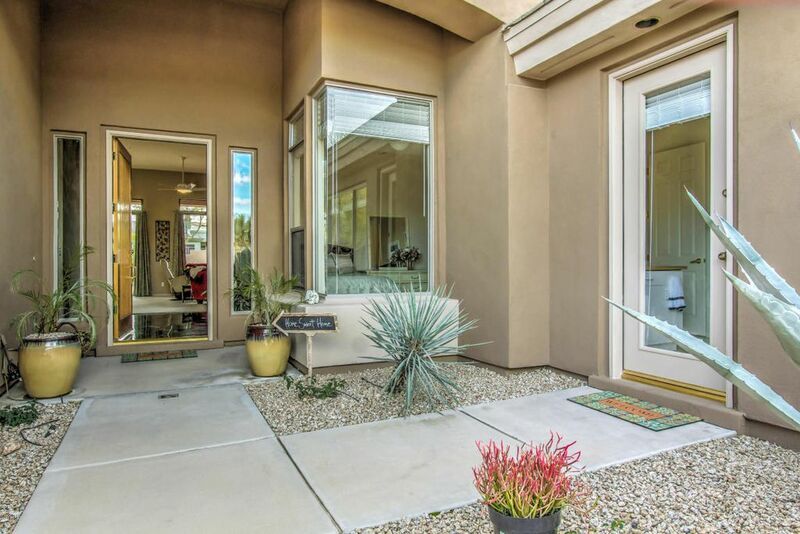 A beautifully-stained wood door looks fantastic in our desert landscape, but you don’t have to spend thousands of dollars to upgrade your door. A simple coat of paint in a contrasting color or fresh stain on the existing door will go along way to tidying up your entryway. Don’t forget to also update the hardware for a complete look! Tidy up the landscape by removing any dead plants and weeds. Keep bushes and grasses properly trimmed and ensure that your native plants are properly cared for. 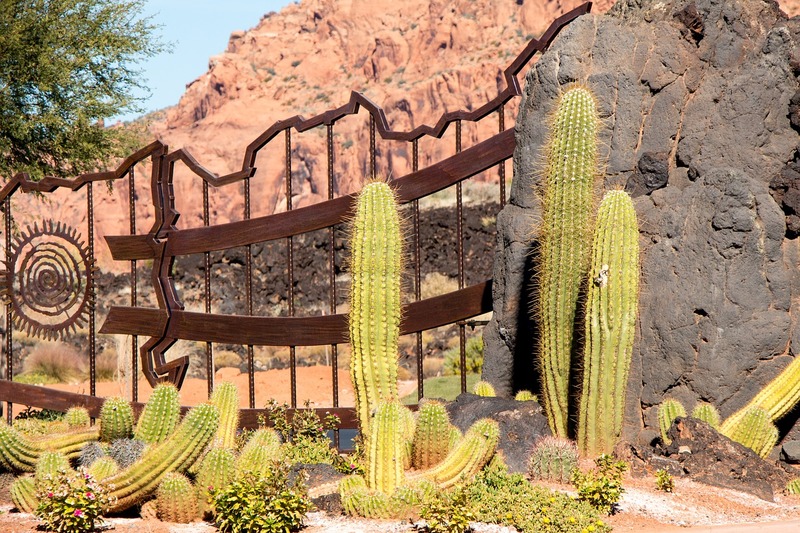 Fill in bare spots with fresh plantings, and pay attention to colors and textures within your landscape – you want to have a variety of colors and textures to enhance the desert backdrop. You can even add some brightly colored planters filled with your favorite sun-loving annuals or an arrangement of small cacti. When was the last time you updated your house numbers? If the numbers are faded or rusted, or simply boring, invest in new house numbers, or at a minimum paint them so they look fresh. It’s such a small thing, but can go a long way to show that the home has been well-cared for. Upgrading your landscape lighting can make your home really stand out for evening showings. Invest in a new porch light and make sure all your sidewalk and landscape lights are in good working order. If you don’t have landscape lights, consider purchasing a few solar spotlights, that can be used to highlight key landscape features like a favorite cactus or shrub, or solar walkway lights. Solar lights are less expensive than wired lights, easy on the electric bill, and will give your home a great evening look. When you are ready to sell, we can help you decide which updates you need to to make inside and outside your home that will get the most bang for your buck. Susan Pellegrini and Karen DeGeorge are ready to put their care and expertise to work for you. Buying or selling, our first-class service comes with a wealth of experience and eye for detail, ready to focus on you. Visit our website to learn more and contact us or give us a call at (480)- 315-1575, we’re here for you.